Services, participation, & service summaries for March are entered. Use new naming conventions. 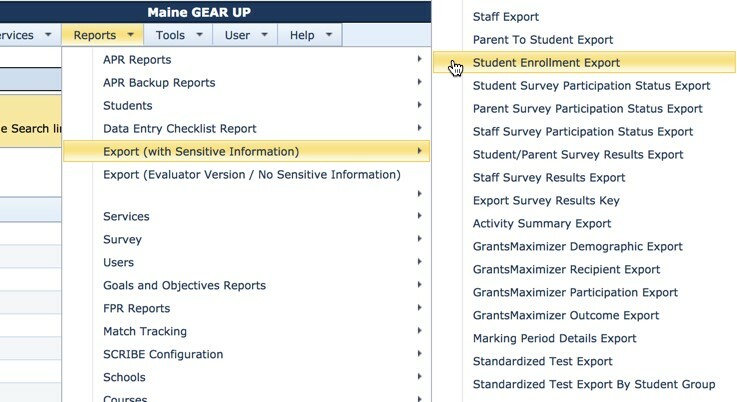 Ensure student enrollment is up-to-date (new enrollments & exits). September - March tasks not completed. Review Duplication of Services and complete document (if you have TRiO) while creating year 4 action plan. All of our GEAR UP students have a story to tell. It's up to us to help them find their voice to tell it. 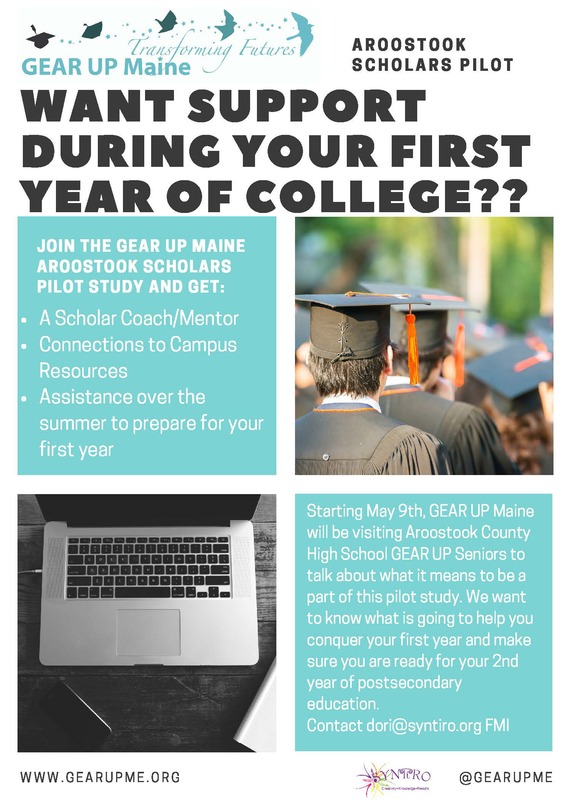 Do you know a student who would be interested in sharing their story with GEAR UP Maine? Be it a story of success or struggle, we want to hear it and share it. It's so important now, more than ever, that our students' voices are heard. Please contact GEAR UP Maine Communication Specialist, Kayla Hopkins kayla@syntiro.org if you are interested in diving into this student story-telling adventure. In May, data stewards will be asked to update their 2017 graduates. Exporting a file from SCRIBE will save a ton of time! The quickest way to do this is to do the following. 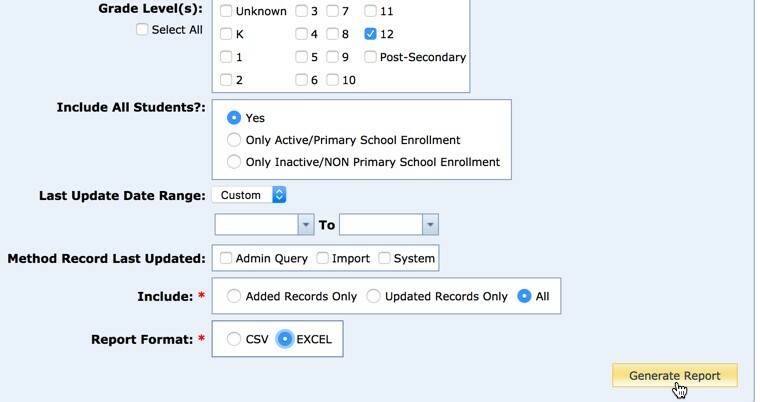 Export the Student Enrollment Export file. Columns H, I, J, K, & L require a “Yes” or “No” answer. Column M does not need an exact date. Feel free to use May 1, 2017 for all seniors for whom you know have completed their FAFSAs. Add a field for column N called “HighSchoolGraduationDate”. Be sure to eliminate all spaces between words in the field names! THEN, import the completed file as a “Graduates” import file type. More info will be sent to data stewards in May. 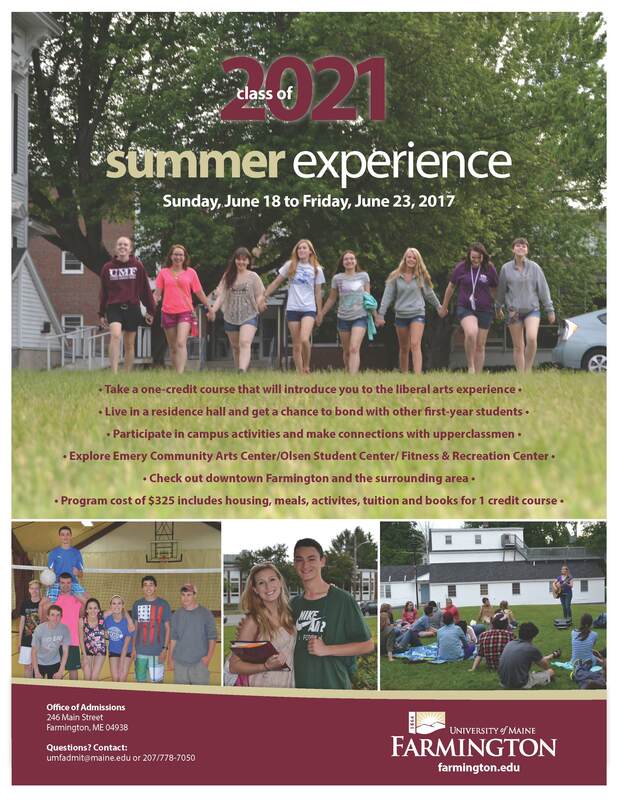 This Summer, GEAR UP Maine and UMF will be sponsoring students to attend three different summer programs taking place at UMF. All of these programs are being offered at NO-COST. GEAR UP and UMF will not be funding any summer programs other than these three programs listed. Please share these opportunities with your GEAR UP students a.s.a.p. 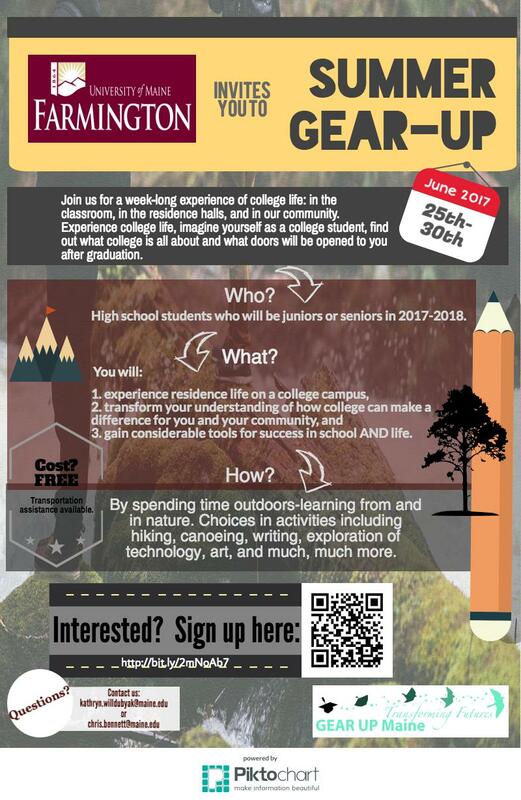 GEAR UP Maine will be sending 2 GEAR UP students from each school to attend the UMF summer experience program at no cost. Contact: UMF Admissions umfadmit@maine.edu 207-778-7050 for more info.